Since 2012, the Ministry of Social Affairs and Statistics Iceland have annually collected and published various social indicators at the initiative of the Welfare watch. Since then, similar indicators have been developed by other statistical offices and international organizations which called for a revision of the Icelandic social indicators. The aim of the revision was to clarify what the indicators should measure, assess the quality of the indicators, and justify the conceptual framework of social indicators in the light of recent developments. Furthermore, a systematic review of previous publication of social indicators was conducted. The revision is described in detail in the accompanying working paper. The result was a conceptual framework of social well-being that is meant to be valid, parsimonious and exhaustive. The 41 statistical measures called social indicators were defined. Each social indicator measures a certain dimension of social well-being. The dimensions are eleven in total and for each dimension the aim is to measure each with at least three indicators. When social well-being is assessed it is important to keep in mind that there is more than just financial deprivation. Deprivation can be found in many areas and is sometimes multifaceted. A person who lacks safety, social connections and health can be worse off than an individual who only has poor health. 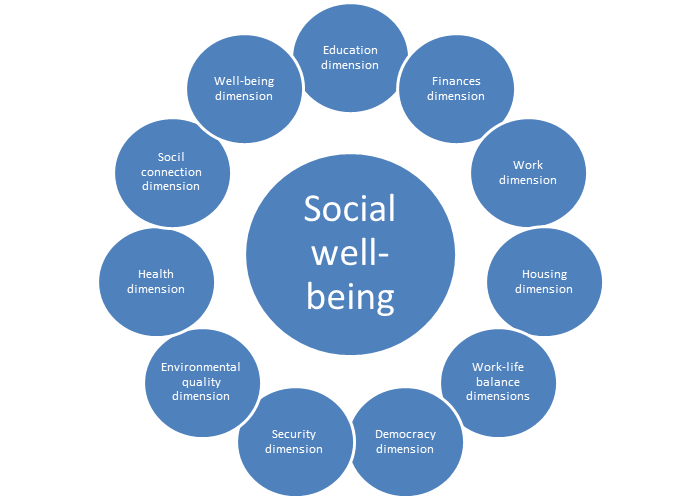 By exploring many dimensions of social well-being simultaneously, multiple deprivation and inequality of social well-being can be better understood. The new conceptual framework of social indicators was designed to facilitate comparisons of well-being between different groups of people. From now on, the annual publication of social indicators will discuss general social well-being of the population. In thematic issues, the social well-being of different groups of people, or the status of a certain dimensions, will be examined more closely. The first issue which follows this new conceptual framework will be on the well-being of immigrants compared with the well-being of the domestic population in accordance with the methodology described in the working paper. The issue will be published on 31st of January. So far, the general social indicators have only been published by the Ministry of Welfare. In the future they will be published by Statistics Iceland as well. With this change the Icelandic social indicator system can benefit from general developments of the infrastructure and dissemination of Statistics Iceland.